During 2011 some members of the Executive Committee (John Booth, Tony Beckett, Margaret Horsburgh and Lisa Marwick) of the Eastern Bay of Islands Preservation Society (EBoIPS) had discussions about the Society’s involvement in a potential Wetlands Restoration Project – Tangatapu – land at the commencement of the DoC Whangamumu track near Rawhiti Rd. The project will be discussed at our AGM in January but meanwhile we would like to ensure there is support from Society members for the EBoIPS connection with the project. In summary the project involves the Society working collaboratively with ‘Living Waters Bay of Islands –Wai-Ora’ group ,Te Rawhiti marae, DoC, the Northland Regional Council and other local community groups on a wetland restoration project. The project links with the pest control initiatives which are supported by the Society. Wetlands are of extreme significance and in the last 150 years New Zealand has lost 90% of its wetlands primarily due to draining for farming. Many of the remaining wetlands are also degraded due to pollution, grazing and drainage and the presence of invasive plants. Wetlands are areas where water is the primary factor controlling the environment and the associated plant and animal life. Wetlands are amongst the world’s most productive environments. They are cradles of biodiversity, providing the water and primary productivity upon which countless species of plants and animals depend for survival. Wetlands were a treasure trove for early Maori, providing abundant supplies of flax and raupo for clothes, housing and domestic purposes with the eels, fish and birds a good food source. ‘Living Waters’ have been leading the proposal for the restoration of Tangatapu – the land at the commencement of the DoC Whangamumu Track near Rawhiti Rd. Fence the restoration area to prevent stock (currently cattle and horses) continuing to damage the area. As the area begins to rehabilitate, maintain with weeding, possible planting. 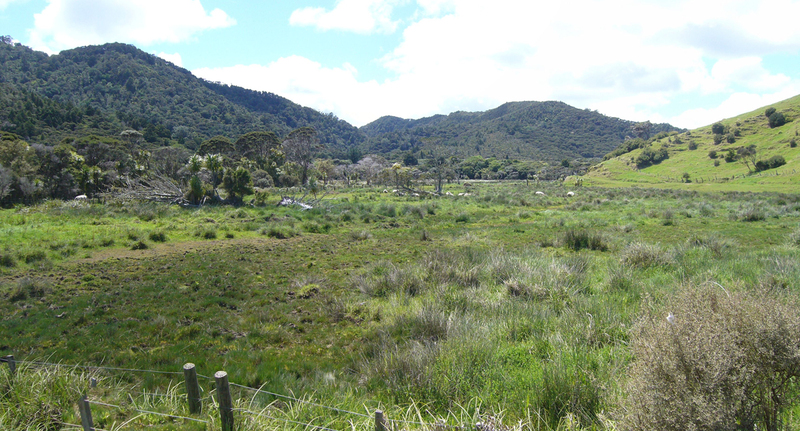 Work with DoC to upgrade the Whangamumu track, in particular the section that may cross the restored wetland. Complete sealing the road which will require a small drain to be constructed on the seaward side of the road. Work with other community groups to protect the coastal salt marsh which the wetland drains into. Alongside this, the land owner will be working to establish QE11 covenanting of the wetland area – this is in very preliminary stages. While the project is developing there is some urgency to carry out the first stage – i.e. the fencing of the land with grant applications made to secure funding for this. Living waters is working with community and NRC to establish a project management plan which ensures the project is community led, consultation is appropriate, there is management oversight, any contracts are appropriate, monitoring occurs (what is being achieved in terms of biodiversity) and so on. ‘Living Waters’ from their Kerikeri base are not in a position to continue to lead the project and someone to ‘spearhead’ the project, preferably from the local community, will in the near future need resolution. Meanwhile a number of grant applications are either underway or being considered in order to allow the fencing to go ahead. ‘Living Waters’ have applied to the Ministry for Environment Community Environment Fund for a 3 year grant which would support riparian restoration in the Kerikeri /Waipapa area, and on the Waiwhakangarongaro Stream in association with Springbank School, Kerikeri, and with reference to the Tangatapu project. EBoIPS has supported this application. The intent is to next apply to the NRC Environment Fund for a grant to proceed with the fencing. This fund is available for this purpose, ie work on private land that will bring public benefit in terms of water quality and biodiversity (‘Living Waters’ will advance this). If successful this would cover half the complete costs of fencing – usually materials. Further grants will be sought for the labour costs associated with the fencing with initially a grant application made in collaboration with ‘Living Waters’ to the FNDC community fund. If you would like more information or have any comments please email the EBoIPS secretary (m.horsburgh@xtra.co.nz) or John Booth (boothy3@yahoo.co.nz). The project will be fully discussed at the AGM in January.